Two men have been cleared of murdering a teenager who was stabbed to death in north Kent. A judge at Maidstone Crown Court told jurors to formally acquit brothers Sean and Gerry Duhig, aged 23 and 27, saying there was no case to answer. 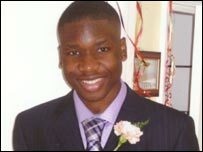 The pair, both from Melbury Drive, Camberwell, south-east London, had denied murdering Christopher Alaneme, 18, in Sheerness in April 2006. Three other men from London are still standing trial accused of his murder. Peter Connolly, 29, of Carisbrooke Gardens in Peckham, Andrew Giblin, 26, of Commercial Way in Peckham, and Terance Beaney, 23, of Rideout Street in Woolwich, all deny the charge. They have also pleaded not guilty to another charge of wounding with intent, which relates to taxi driver Mark Davies, 29, who survived being stabbed. The court has previously heard evidence Mr Alaneme was chased by a group of men, after one of them was rebuked for an alleged racist comment about the victim. He died after a knife penetrated his liver.